These racks are clear acrylic constrution with polycarbonate posts. 69101 has a capacity to hold 60 petri dishes of 90 mm size while 69102 one can hold 56 petri dishes of 60mm. These racks are very useful during inoculation, incubation & storage. Visibility from all sides enables the culture to be seen & checked during incubation. 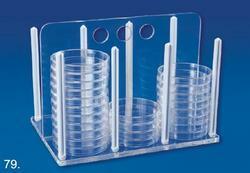 - Petri Dishes Rack is clear acrylic construction with polycarbonate posts. These Racks are clear acrylic construction with polycarbonate posts. RP-27121 has a capacity to hold 60 Petri dishes of 90 mm size while RP-27122 one can hold 56 Petri dishes of 60mm. These racks are very useful during inoculation, incubation & Storage. Owing to our proficiency in this domain, we are providing our clients an optimum range of Petri Dish Rack. Offering you a complete choice of products which include plastic dish rack 1 tier, plastic dish rack 1 tier with tray and plastic dish rack 2 tier with tray.We are one of the leading manufacturers , supplier and exporters of Plastic Dish Rack in Mumbai, India. This Rack is a clear acrylic construction with white Polycarbonate Posts. It has a capacity to hold 60 petri dishes of 90 mm size. This rack is very useful during incoluation, incubation & Storage. Visibility from all sides enables the culture to be seen & checked during incubation. 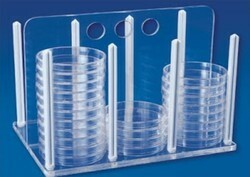 Rack For Petri Dishes 2 Pcs.